which will take place at the Castle of Monticelli, historic residence in the province of Perugia. The idea by the artistic director, M ° Maurizio Mastrini, is creating an opportunity to gift a high level music set in a characteristic and suggestive place, which evokes the historical beauty of the Umbria region. In order to better involve guests and the public, by immersing them in this atmosphere, the project aims to promote the artists and their music without leaking the day of their performance. 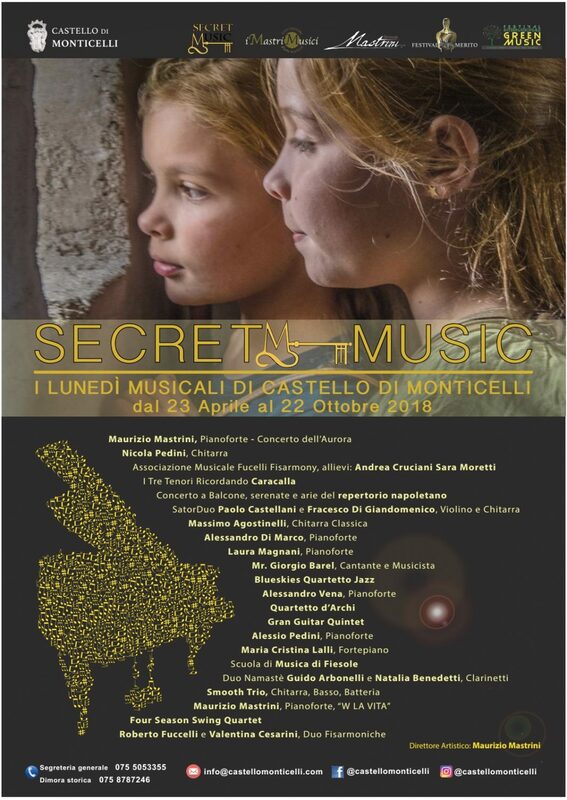 The spectator will onky know that a professional musician will perform at the Castle, but the congruence between date and artist will remain a secret (so, the concept of “Secret Music”), remaining firm the guarantee of a highly professional, qualitative and involving show.